Hey everyone, Vajra here! 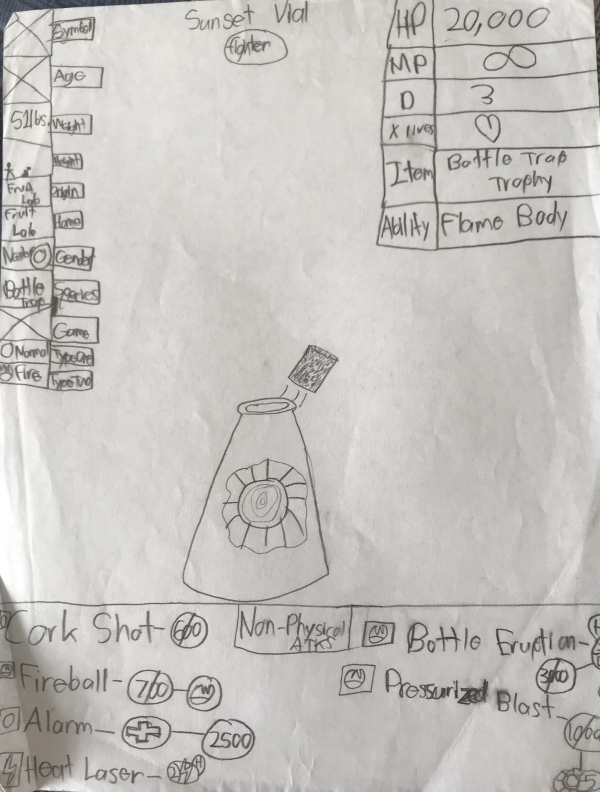 I recently found a gold mine while searching through my old drawings - a Pokemon-like trading card game that I made (with my best friend) when I was around 13 years old! I decided I'd share the designs and my thoughts on the game because it takes me back to a time where I was (very) slowly improving at art, making a lot of cards a day, sometimes up to ten per day! I'd wager I have about 200 designs, ranging from Pokemon to monsters from Dragon Quest (though the majority are my own designs!). These cards, however, are not balanced at all. Some are too powerful, doing loads of damage with no penalty. Some are too tanky. I made one with ten billion hitpoints! Too many types, broken mechanics, and a general lack of any real strategy are also all problems I found when re-evaluating the game. Lately, I've streamlined a bunch of the types and changed the plan for the size of the actual cards, however, and I plan on making a comeback with these as a personal passion project! I figured it'd be fun to see people's thought on these, and provide suggestions to future cards! So without further ado, let's get to showcasing these! This post's card is Abstraktika Rast! Abstraktika Rast's Card Stats wrote: Symbol:The Symbol slot is meant to show...just that, if the character has one. Abstraktika Rast does not. Age:The Age slot shows how old the character is. Abtraktika Rast is kind of ageless, since it's an extraplanar being. Height:The Height slot does not use numbers (if it did, it would use feet and inches as the units), but instead shows a small stick figure that is meant to represent an average adult human male compared to the character's actual size. Abstraktika Rast is pretty big! Origin:The Origin slot tells where the character was born or created, whether it's fictional or real (very few cards use real-life locations, though!) Abstraktika is a plane based on strange and twisted versions of already-weird Dungeons and Dragons monsters, like Abstraktika Rast being a regular rast that's really freaking weird to look at. Species:The Species slot tells what species this character is. 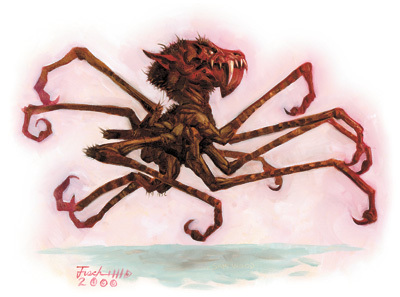 Rasts are from Dungeons and Dragons, looking like a cross between a floating spider and a gargoyle of some sort. Abstraktika Rast does not look at ALL like one of these, since it's from another plane like Abstraktika. Game:The Game slot is an info slot that tells if the character is from a IRL game, and which game if so. This slot will be removed in the final version of Fight Card's reboot. Gender:The Gender slot shows whether the character is male or female, or has no gender specified (usually reserved for "team cards, with multiple charaters on one card). Being from Abstraktika, it's not likely that this one is male or female, and thus Abstraktika Rast has no specific gender. Type One:Type One is the card's primary type. Once upon a time, there were twenty-seven types, but now there are only eight. Abstraktika Rast's first type is Dark. Type Two:Type Two is the card's secondary type. This will not be returning in the reboot of Fight Cards, since all cards will be single-typed (not to mention I need to work out weaknesses...). Abstraktika Rast's second type is Fire. 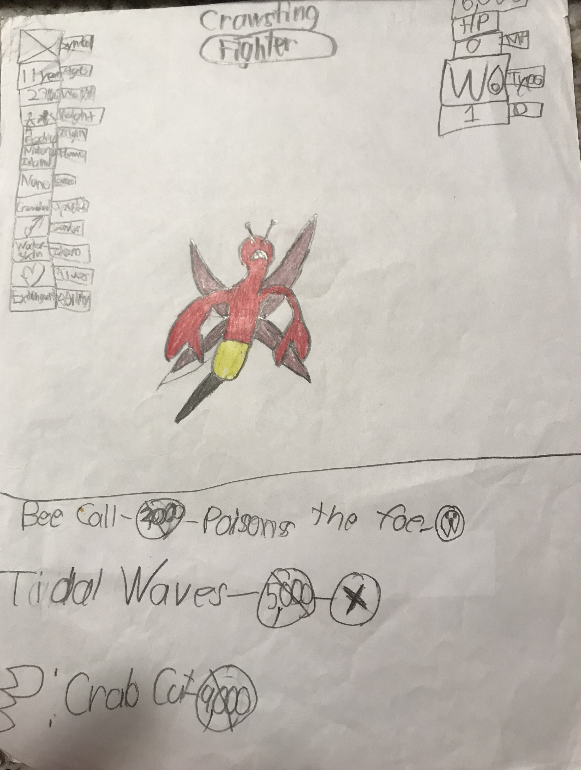 Bio:The Bio slot is a short little Pokedex-like entry that provides more information about the character. I'll get to this one in a moment; not all of my cards have Bio slots, but I'm going to change that! Alright, so that's all I plan on revealing about game mechanics in this post. Let's actually take a look at this ugly thing! "An extraplanar being that looks like it tried to escape a modern art gallery. It is more intelligent than an average rast, however." ...to the multicolored monstrosity up there, but it is what it is. 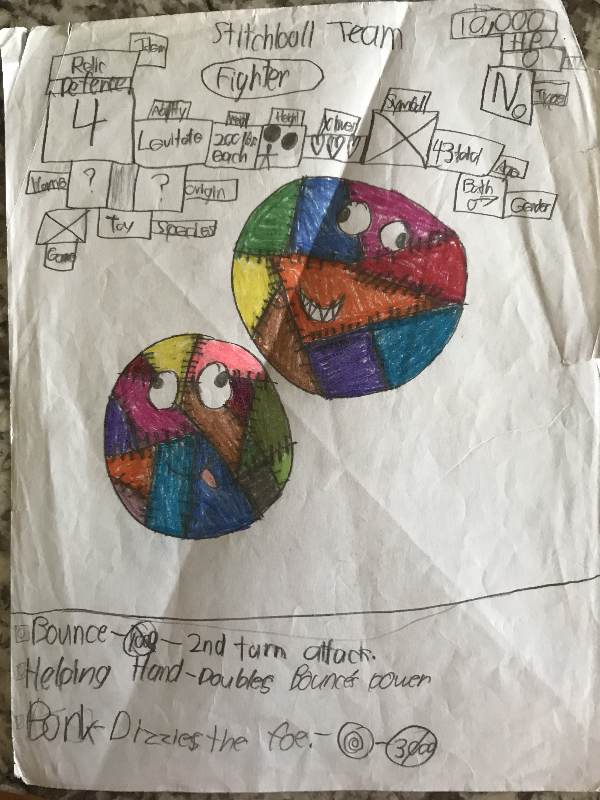 A lot of my cards come from my dreams, and this one is clearly no exception; I recall it being a random monster that had a constantly-shifting body, being about as thin as Mr. Game and Watch one moment to being a blobby as a bubble slime from Dragon Quest the next(though it kept the colors and patterns)! This monster likes to confuse and disorient its prey, making sure they're staggering around before moving in for the kill! Decided to post a couple more entries for tonight. Number 2 is a mix of two games: Pokemon and Final Fantasy Tactics A2! Enter Drifloon Trickster! Drifloon Trickster's Card Stats wrote: Symbol:A playing card, with a Poke Ball-themed Ace of Spades motif. Game:None specifically for this one. Now for the right bar! Drifloon Trickster's Card Stats wrote: HP:This shows the fighter's health. If it drops to zero, it's KO'd! D:Short for Defense. Again, not used anymore, but it used to negate 100 damage points for every one Defense. So if an attack did 1000 damage to Drifloon Trickster here, with his 5D stat he'd actually take 500 damage. X-lives:Yet another redundant (and frankly, hella overpowered!) mechanic I figured was unique when I was a teen. With this, for every X-life a card had, it'd get a full refill on HP if it was KO'd, effectively quadrupling Drifloon Tricksters's health here (three X-lives plus the one first potential to KO)! Ability:Similar to any Pokemon game from RSE onwards, Fight Cards features abilities that can do all sorts of nifty effects. This one has Shuffle, an exclusive Ability that forces Drifloon Trickster to use its Luck of the Draw attack every three turns. Item 1:The fighters can have hold items, similar to Pokemon as well but those will be separate types of cards when I get things rebalanced. In this card's case, Liquimetal is basically Pokemon's Metal Coat, boosting damage for Metal moves by a set amount (usually 1000 damage more). Item 2:Usually, cards only have one hold item but sometimes they can have a Trophy, which usually goes in the second Item slot. Trophies are gained by a player if they KO this card and win the battle, though they are purely bragging rights only and have no use. More of a way to say "Hey I beat Woofler Champion!" as opposed to a physical IRL item. Phew, that's enough for now! Let's go ahead and talk about this bluffing buffoon of a balloon! A Drifloon that can speak the human tongue. He is an excellent gambler and a master of sleight-of-hand. He lives strictly by the Trickster's Creed - "If you don't get taken in, you won't get taken out!" He's decent with melee, too. If you owned a regular Nintendo DS and liked Final Fantasy in any capacity, chances are you played Tactics A2, which had more jobs for battle and missions than the previous entry. One such new job was the Trickster for bangaas, who were essentially gamblers like Setzer from FF6 and used thrown playing cards as weapons. 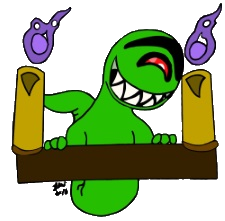 They were really friggin' cool, and I do love me some Ghost-type Pokemon, so I took what was then my favorite Ghost-type Pokemon and made it into a Trickster. You'll note that he's not colored in like the Abstraktika Rast, unfortunately - the majority of cards have no color, IIRC. Fun fact: I used to do volunteer work at a nearby food pantry, and I drew this fighter in my downtime! 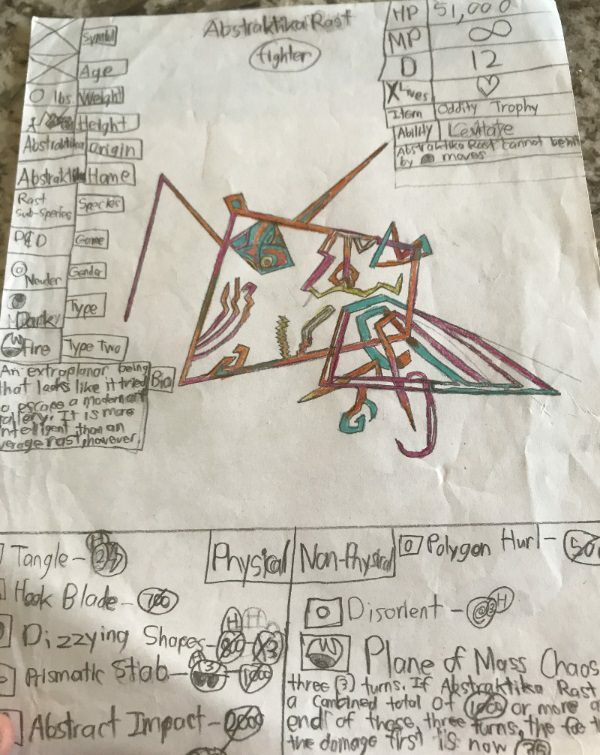 This was in the DPP days of Pokemon, so Pokemon like Yamask, Honedge, and Sandygast did not exist yet, but I totally would have considered something like "Blacephalon Trickster" if Alola was out back then! That's all for now, but I'm making one more post before tonight's over! Stay tuned...it'll be an OLD card! Ooooohh, boy....where do I begin? Maybe the with weirdly-shaped letter "P" down there for his Crab Cut attack? That's a Power Attack, which is like an ultimate ability in most MOBAs like League of Legends and SMITE, but I never figured out how they would be different. "A hybrid of crayfish and hornet, with the best of both species in terms of ways to hurt others. He is actually quite lonely, however, and has few friends. So...Crawsting. 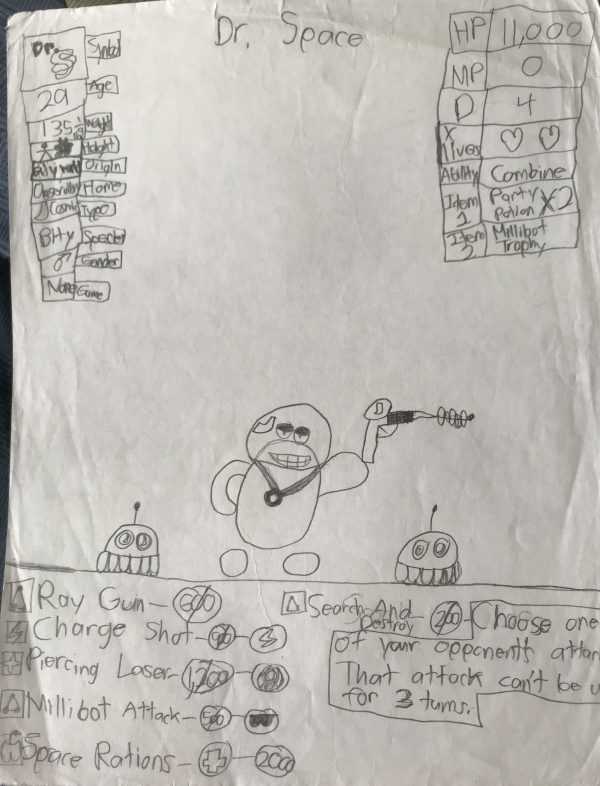 One of my absolute earliest cards; it may not look apparent, but I think I had just turned 13 when I drew him. I colored him in later and gave him a halfhearted attempt at info slots, but it still does not excuse the ripped card paper and overall-shoddy colors for his wings. I'm done posting for tonight, but rest assured - when I get the time, there will be more cards. The next one I post will explain status ailments! Here's card number 4! UGH! Look at this ugliness! Look at the Stitchball Team! These are actually a misinterpration of the Yoshi's Story monster Attacky Sack, (https://www.mariowiki.com/Attacky_Sack) but don't tell that to preteen me! These, like Crawsting, are one of the earliest cards; in fact, I think they're the second or third card I ever made! The info slots are super cluttered up there and you can tell there's some amateurish coloring there. And yet, I'm still covering this card as the topic...whatever. Stats! Game:None specifically for this one, maybe because it's a ripoff from Yoshi's Story. "Two round bouncy balls that appear to be alive and sapient. They cannot be separated after a certain distance between then is achieved." Let's talk about how status ailments work! Ignore the putrid colors above and focus on these! This is for Paralysis. 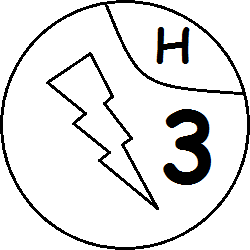 The "H" means you must flip a coin/roll an even number on a 6-sided die to inflict the status. The "3" denotes how long the status lasts. Naturally, these will be simplified for the reboot. Poison-The fighter takes 300 damage every turn. Burn-The fighter takes 200 damage every turn and has halved attack power. 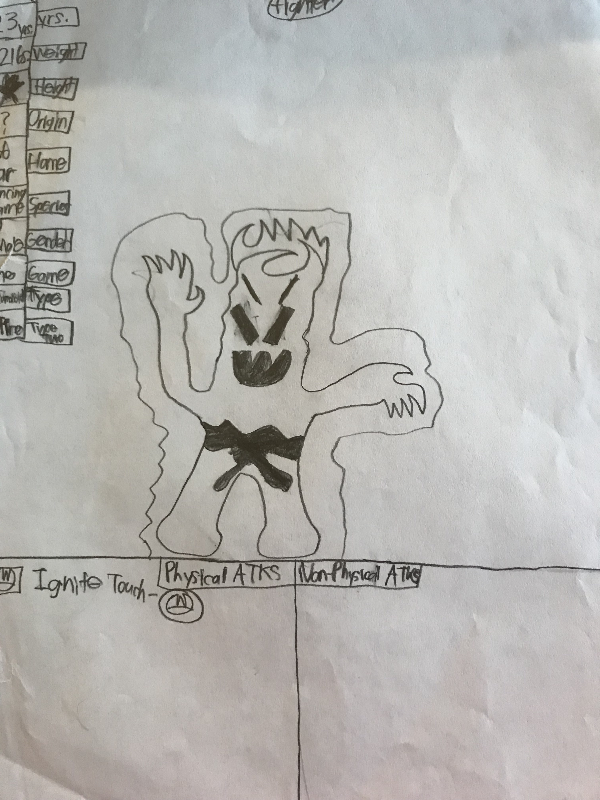 Paralysis-The fighter cannot move, and takes double damage from Physical attacks. Frozen-The fighter cannot move, and takes double damage from Non-Physical attacks. Fire moves used to be able to melt the ice, but since all statuses are temporary, this was deemed a bit too different. Sleep-The fighter cannot move, with no changes to damage taken. Every turn, the player flips a coin. If heads, the card wakes up. Giant (previously known as Bulked Up)-The fighter has double attack, but must flip a coin. If heads, the fighter hits, if tails, the attack fails. Shrunk (previously known as Toned Down)-The fighter has halved attack, but always hits no matter what. Dizzy-Flip a coin every end-of-turn. If heads, the fighter's attack hits. If tails, it misses. Confused-Flip a coin every end-of-turn. If heads, the fighter's attack hits. If tails, it hits itself for 500 damage. That's all I have for right now! I'll be explaining abilities more in-depth next time! Last edited by Vajra on Sun Sep 16, 2018 3:10 pm, edited 1 time in total. Number 5 is alive! That is, if your definition of "alive" is a man made of flame who sings for a living! Meet Burny Joel! Game:None, but his species is from Dragon Quest! "A dancing flame with a great singing voice. He's the one behind the #1 jam "I Definitely Started the Fire!"." So, uh...you can see Mr. Burny here isn't finished. Like, at all. A lot of cards suffered this fate, where I drew them and gave them SOME stats (sometimes even forgoing that!) but then sadly got distracted or gave up. Burny Joel is in the former camp, since I wanted to finish him, but then Dragon Quest Monsters Joker's Wi-Fi worked for about a week for me, but then stopped after my dad figured out what I did to access said Wi-Fi (I reset the router to make my old DS work)! Unfortunate, but at least I finished his art! I may be posting another card tonight if I can stay awake long enough! But before I go, here's a few random abilities! Smolder Coal: If the fighter is hit by a Stone-type move, it heals instead of taking damage. Party Hard! : A common ability that doubles any attack power over 500, but only every other turn. Levitate: Stone moves always miss the fighter with this ability. Betcha can't guess where this one came from! Last edited by Vajra on Sun Sep 16, 2018 3:09 pm, edited 1 time in total. I've moved for the time being! This was an ongoing thing for the past few months, so I've been quite busy, but I haven't forgotten about this! As a result of not posting in a while, I'm going to share TWO cards today! First up, #6 is a card with assets a few of you might recognize - maybe not the main attraction, but the sidekicks, maybe? Either way, here's Dr. Space! "This bold scientist Bity loves exploring the wonders of outer space! "Bold" may as well mean "clumsy" for him, however, as he's always in need of rescuing..."
So....the Bity species. I don't fully recall why, but I was playing with my dog as a child and I started going "BITY BITY BITY BITY" to cutely tease her, moving my hands like a sock puppet (minus the sock) in an attempt to lovingly pinch her back fur. A few years later, as a result of liking the name, "Bity" developed into his own character, with a brother, friends, enemies, and a world I still have to flesh out a bunch of! Eventually, the gibberish word came to refer to his species as well. Yep. 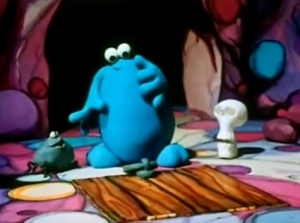 Berk from the UK TV show "The Trap Door". As an American, I swear I had never heard of this show until about five or so years ago! A bit uncanny for how similar he and Bities look, other than the fact that Berk has actual digits on his arms and legs. 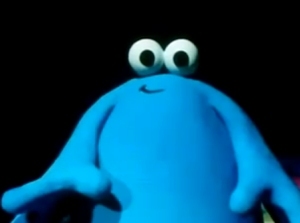 That and he's blue, whereas Bity himself is flesh-colored. Then one day, I "read" a hilariously bad children's book my best friend made when he was like....three years old? It was about a human astronaut named - surprise! - Dr. Space, and how he got eaten by an alien. To this day "UH OH! said Dr. Space." is still a bit of an inside joke between him and I. Regardless of the book's dubious quality, I liked the name of the titular Dr. Space enough to revive him and adopt him as a Bity! But what about the thing I said some of you would possibly recognize? I'm starting to doubt anyone would with my lack of precise art skills, so instead I'll show you what it is. See those two robots on either side of Dr. Space? Any current or former Neopets players in the house? Those are Millipod petpets! I mistakenly called them Millibots, but you get the idea! The next card I'll post momentarily! Last edited by Vajra on Fri Mar 22, 2019 2:04 am, edited 3 times in total. And now for #7, Sunset Vial! "A booby-trapped bottle from the Fruit Lab that spews out flames when activated. It originally was an experiment involving several mijirus (also known as the living dead's flamethrower or simply the mijiru pepper). Not much to say here. The name came from the music for a track from the N64 game Snowboard Kids (ironic, considering that this is a fire-based card) that I had been listening to at the time. The track in question? Sunset Rock. That's all I have time for right now! I'll try to get back into posting more regularly! I asked my best friend for a random letter of the alphabet. He said "V". So here's card #8: Voidos! "One of Galaxter's avian offspring. Voidos is the bird representing darkness and playing dirty. While he isn't evil, he does have power over void and shadows, two things that would make you think otherwise. Eggan Peak is probably one of my favorite things I wrote lore for in Fight Cards - a mountain home to a scientific bird alien named Galaxter. 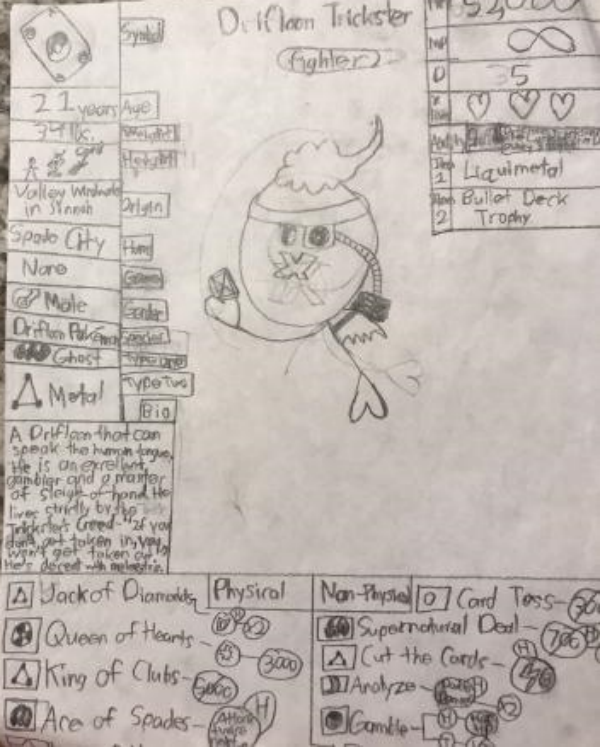 As an alien with a big heart, he wanted to start a family, but he had no spouse or any surviving family, so he used his life-creating powers to make a bird for every card type there is! 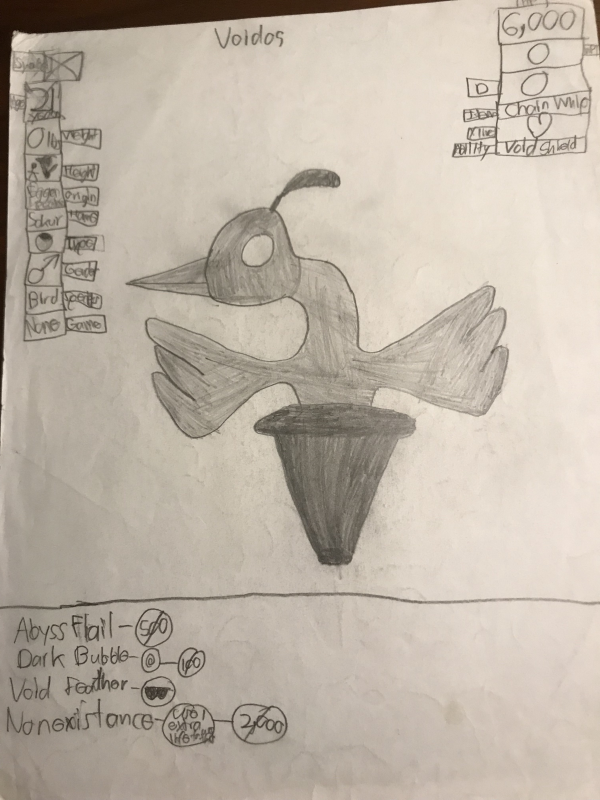 Voidos is the bird for the Dark type; as a note, all the birds started out as copies of Articuno, Zapdos, and Moltres (at least for the Fire, Electrical and Ice birds), but eventually I started to branch out design-wise and made some of them more unique. All of their names end in "os", so you'll be able to tell if it an elemental bird when I post it! More later! Galaxter does have a card, but I'll post that one in due time! It's been a while, hasn't it? I've been meaning to get back to this sooner, but life kept finding things to throw at me. As a result, I'm going to share a whopping three cards today to make up for slow updating! First up is the one I initially was going to show, but then i asked Xward in Monster Crown's Discord for a random letter of the alphabet. He answered with "D" so once I show you this next card, the other two will have their names begin with that letter! So here's card #9 - Jirachi! "This Pokemon is capable of granting any wish written on its head tags. Careful what you wish for, though - one man wished for the Pokemon Groudon and got an evil clone of it instead!" Yep. This is THAT card. The card that I mentioned having a crapload of health and defense, with ten billion HP, that and 90 D! Not only that, but an attack called Anti-Matter Bomb that does two hundred million damage - yeah, I get that antimatter is dangerous to touch, but it's not quite fitting for this purpose! Truthfully this started out as a drawing I made, and showed my friends in school when I first saw Jirachi in Nintendo Power before I went to school, but it eventually became its own card! Ignore the star at the top - it's meant to signify cards that can't be used in actual battles, referred to as "Promo". Last edited by Vajra on Fri Mar 22, 2019 2:40 pm, edited 3 times in total. This next card is in very poor condition - it's a very old one, and one that has a character that was subject to a lot of speculation to 11-year-old me. It is Card #10 - Diskun! "The mascot for Nintendo's Famicom Disk System. This one seems to have come from Super Smash Bros. Melee's trophy, since it can summon the trophy stand as a high-speed spinning wheel attack." Diskun was an enigma for preteen me - I knew it existed in Melee as a trophy, but I was nowhere near good enough to get every type of win bonus and penalty so I didn't know what it was or where it was from back then. I was the kid among my circle of Smash player friends who was able to get five KOs in Cruel Melee by spamming Pikachu's Thunder attack, but when I failed at that many many times beforehand I nearly threw my controller in rage across the room...on the first loss (I was not a patient lad) so something like taking no damage during Classic Mode was...yeah. Put simply, Diskun's trophy was out of my reach, but I liked his design enough to use it for my cards! Last edited by Vajra on Fri Mar 22, 2019 3:08 pm, edited 5 times in total.